In a documentary about the Battle of York that aired on CBC Radio’s Ideas last week, Sandra Shaul, project manager of the City’s War of 1812 bicentennial commemorations, noted she was “intrigued as to why the City of Toronto would want to commemorate a battle that we so badly lost.” She reflected that it might be our city’s nature to celebrate losers (“look at our sports teams”). 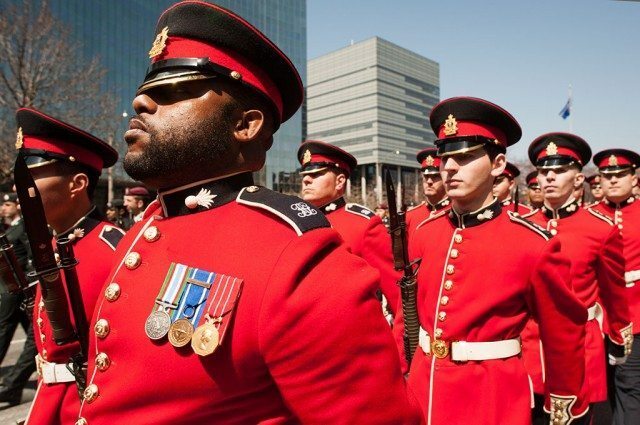 But even if the American invaders won on April 27, 1813, thousands of Torontonians turned out exactly 200 years later to show their respect for the British military units and First Nations warriors who took to the battlefield to defend what is now our home. While the parade wound through the core, over 500 people followed the path of the Battle of York during a two-hour walk from the Palais Royale to the fort. Heritage Toronto unveiled a new commemorative plaque at the American landing site, one of five stops where historians described the main stages of the battle. Holding up a “Brown Bess” standard-issue British musket, Richard Feltoe used the backdrop of the Fort Rouillé monument to describe military equipment and techniques used during the battle. He explained how troops on both sides lined up in rows to fire volleys at each other, creating dense clouds of smoke. Bright uniforms and high hats allowed opponents to see each other amidst the fog of musket fire, ensuring continued carnage. At the site of the Western Battery near the Princes’ Gates, Ken Purvis talked about the antique equipment used by the British during the battle. The oldest artillery gun, which is displayed at Fort York, dated back to Oliver Cromwell and the English republic of the 1650s. (For perspective, imagine American Civil War equipment deployed in modern conflict.) Purvis also performed, on fife, the tune the advancing American forces played as they approached Fort York: “Yankee Doodle,” a song the British later used to taunt them while parading prisoners in Montreal. At Fort York, the public mingled with period re-enactors and modern military. Visitors perused displays of objects ranging from wampum belts to pre-painless-dentistry surgical instruments. The ceremonies included the unveiling of three plaques to be placed in a new visitor centre, scheduled to open next year: two were refurbishments of fading bronze plaques installed shortly after the fort converted to a museum in 1934, and the third was a new marker honouring the First Nations. Our gallery includes images taken throughout the day. Additional material from Capital in Flames by Robert Malcolmson (Montreal: Robin Brass Studio, 2008). Images 16-28 by Jamie Bradburn/Torontoist.